Murder by Gaslight: Alabama Lynching. Two Murders Strung Up by a Mob. Not given a chance for prayer. 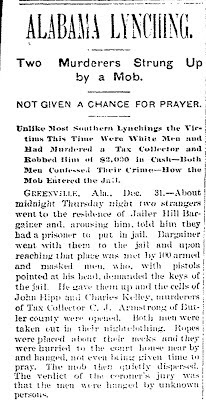 Unlike Most Southern Lynchings the Victims This Time Were White Men and Had Murdered a Tax Collector and Robbed Him of $2,000 in Cash—Both Men Confessed Their Crime—How the Mob Entered the Jail. Greenville, Ala., Dec. 31. – About midnight Thursday night two strangers went to the residence of Jailer Hill Bargainer and, arousing him, told him they had a prisoner to put in jail. Bargainer went with them to the jail and upon reaching that place was met by 100 armed and masked men, who, with pistols pointed at his head, demanded the keys of the jail. He gave the up and the cells of the John Hipp and Charles Kelley, murderers of Tax Collector C. J. Armstrong of Butler county were opened. Both men were taken out in their nightclothing. Ropes were place about their necks and they were hurried to the court house near by and hanged, not even being given time to pray. The mob then quietly dispersed. The verdict of the coroner’s jury was that the men were hanged by unknown Persons. On Dec. 17 last, Tax Collector Armstrong while collecting taxes in Butler county was waylaid, murdered and robbed at Panther Creek bridge, the murderers getting $2,000. Rewards amounting to $1.500 were offered for the arrest of the murderers and great indignation existed among citizens. A week ago John Hipp, a noted desperado, was arrested for the murder after a desperate fight with the sheriff’s posse, in which Hipp was seriously wounded. Last Monday Charles Kelly was arrested in Monroe county, Ky, as Hipp’s accomplice. The confession of the gang made the evidence convincing. Both were white men. Kelley was found in Monroe County, Alabama, not KY.